Four high school teens (Alex Wolff, Ser'Darius Blain, Madison Iseman, Morgan Turner) discover an old video game, containing a game cartridge titled "Jumanji". They get sucked into the game, becoming the adult avatars they chose (Dawyne Johnson, Kevin Hart, Jack Black, Karen Gillan), and must beat the game in order to return home, with only three lives each. By this point, one shouldn't be surprised at the sight of a long-awaited sequel, or franchise revival. The Robin Williams starrer is the latest to hit the screen, but brings with it the most glaring problem, in the general unnecessary nature of it all. 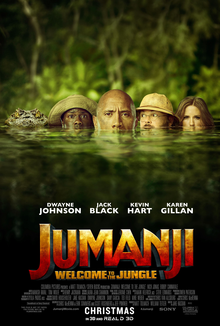 It feels like someone took an entirely different script, and changed the bare minimum to make it a Jumanji film. There's little to justify its existence, and a half-hearted nod to Robin Williams doesn't cut the mustard. Outside of that? There's little else to recommend. The usually charismatic leads go all in with their performances, with Dwayne Johnson initially selling the "young male trapped in a mans body" material pretty well. Unfortunately, the talented cast eventually fall prey to the unfunny material, which seems to be a typical case of the trailer containing the best moments. Bobby Cannavale is especially wasted, playing a dull antagonist who's unnecessary, and evil just because. It's sad to say, but Jack Black is the worst part of it all. He embodies a teenage girl named Bethany, who's obsessed with her phone, and trapped in the body of (as she puts it) "an overweight, middle aged man". It's a performance that gets irritating so easily, often relying on Black to talk about the character's phone, and walking in a feminine manner. It's an overlong gag which feels like it's a relic from a half-hearted 90's comedy, minus some outdated gay panic gags. The lowest point comes when "Bethany" needs to urinate, resulting in a scene with the male characters teaching her what must be done. It's a premise that holds promise, but it's let down all over the place. Not helping to sell the video game wilderness are the poor visual effects used on the wildlife, or the uninspired action sequences. Character arcs and growing relationships are forgotten about without any problem, and the "young characters trapped in older bodies" premise is rarely taken advantage of. Ultimately, what initially promises to be a mixture of The Breakfast Club and Big, set in a video game wilderness, falls flat on its face, and no amount of explosions caused by cake can make up for that. 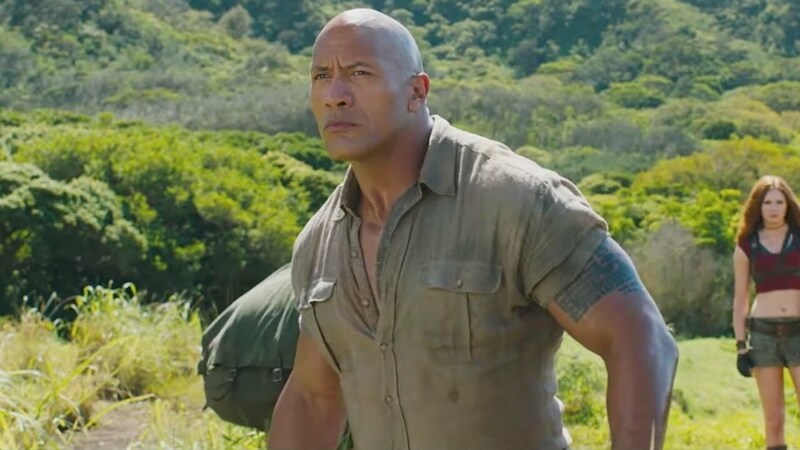 An unnecessary franchise extension lacking in the laughs, Jumanji: Welcome to the Jungle does not have fun and games. Containing action sequences which fail to raise ones pulse, and with the talented cast feeling rather wasted by the end of it.